'Creek to Coast' came to see us again last year to do a segment on our new world class show room including some of our state of the art robotic fish! Neptune's Treasures is a company based on the southside of Brisbane with over 45 years experience in marine art reproductions and taxidermy. We specialise in re-creating many different types of marine and freshwater species of fish and crustaceans which are found in Australian waters and all over the world. We use high quality 2-pac paints when painting the fish and the final product is always covered with three coats of 2-pac clear so the fish is protected from all elements. We have the largest collection of fish moulds in the Southern Hemisphere including multiple Australian record fish including our most recent Australian record Dolphin Fish. This means we can re-produce you're past or present catch enabling you to tag and release yet still hang that whopper on the wall! 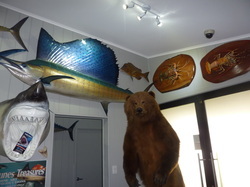 We also feature the largest and most unique showroom of marine art and taxidermy in the country and your more than welcome to come and check it out. Give us a call to arrange a viewing time. Need help fitting out your Man Cave ? - We can help!